Yesterday, apart from highlighting the many winning options plays that came out of Wednesday morning’s premarket report, we also brought up a new idea for the DLTR options chain. We signaled the DLTR Weekly $85 Calls. Those $85 Calls were big movers, trading in a range from 1.90-4.66 on the day. That represented an intraday pop of 145% so cheers to any of those who may have taken advantage of that healthy run. We’re looking to BIG this morning on the heels of an earnings beat and cash dividend annoucment. The stock is gapping considerably above the $50-level to new annual highs. We’re going to be looking at the BIG Weekly $47.50-52.50 Calls* for possible quick-hit trades today. *Caution: We always like to remind our readers that trading options contracts with a weekly expiration on Friday is an inherently risky proposition. Please do not attempt to do so if you are not an advanced-level trader. We’re coming across RLYP at an interesting time today. The stock is gapping up this morning, oddly enough, on news that hit for a rival.The FDA refused approval to pharma giant AstraZeneca for its potassium-lowering drug, effectively leaving RLYP’s competing drug as the lone option in the marketplace. We’ve formulated an options idea for this play as well. With no weeklies available, we’re going to be monitoring contracts within the range of the RLYP 06/03 $20-25 Calls. After initially mentioning KGNX in Tuesday morning’s premarket report and observing a big intraday swing from this subpenny momentum mover (.00189-.0037, +96%), we mentioned yesterday morning that we wanted to continue to monitor its activity. It ended up being a smart idea, as we bore witness to yet another solid upswing. After touching a low of .0025 right out of the starting gate, it didn’t take very long for KGNX to begin a run that lasted for the better part of the entire day. The stock ran hard into the close, touching a new high of .0044. It marked an intraday rip of 76%, and an increase of 133% over our observed low on Tuesday. Once again recording higher lows and higher highs along with stronger than average volume, we’ll need to leave a slot on our radars open for KGNX as we head into week’s end. With the stock building a continuously higher base of support in each of the past four sessions and running to new highs, it is currently in blue-sky breakout territory. We continue to stay on its trail. We also want to provide an update this morning on the performance of one of our options ideas from this week. On Tuesday we tagged the PLCE Weekly $70-75 Calls for observation, and yesterday they really heated up for us with some serious intraday rips from all three sets of contracts. Yesterday we observed a low of .00189 in the stock before it took off, running hard and reaching a high of .0037 shortly before 1PM. That marked an upswing of 96% on close to nine times the monthly average trading volume, and KGNX closed with enough strength (.003) to qualify it for further observation as a possible momentum play. Speaking of momentum, that was what led us to feature HERO in yesterday’s report. The stock had already strung together three consecutive sessions of building higher lows, and it continued that trend for us with a solid performance on the day. HERO traded in a range from 1.52-1.99, a respectable rise of 31% and it did so on a little over three times the 3-month average volume. 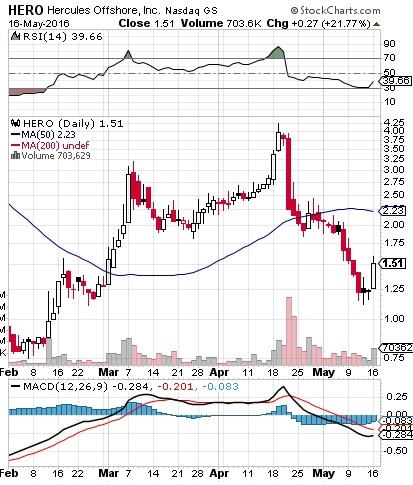 This morning we’re seeing a slight gap-up in HERO to a premarket high of 2.15, which extends our observed range to an overnight gain of 42% We’ll keep tracking this one for a potential continuation of momentum as well. We began tracking MOMO on Friday after noticing the stock coming off of a bottom, and we’ve seen an appreciable move to the upside in the ensuing sessions. The stock is gapping up this morning on a strong earnings report (>>View Highlights), reaching a high of 12.73 in the premarket. We caught MOMO at a low of 11.52 on Friday and have thus far seen an 11% increase, so we’ll want to leave it on the radar and watch for higher lows and higher highs. Speaking of earnings plays, we’re going to be tracking NQ closely over the next couple of sessions. The stock has been trending off of a bottom for the past three sessions and this morning, we’re seeing the stock gap up considerably. Things are likely to get interesting as the company is slated to release earnings post-market today, and a big PR hit wires just an hour ago. We’re also going to be monitoring HERO, which, like the aforementioned stock, has been establishing a solid move up off of recently-registered two-month lows. As you can see on the included snapshot of the chart, HERO went on a massive run from the .70-range to more than 4.00 from February to April. Indicators are ripening for what could be the next big leg up after the recent consolidation, so we’ll be sure to keep an eye peeled for the possibility of a continued upsurge. PLCE is yet another bottom-bouncer with earnings that is gapping up in early trading. We’re going to signal a range of options contracts for observation to possibly take advantage of the momentum. Our target range is going to be the PLCE Weekly $70-75 Calls. Our daily live traders chats are a great way to get involved with what we do. Regular participant DJ spotted another big runner and shared with the room shortly after the opening bell. We saw it at .03 before it went on a monumental run to hit a high of .465 on news with TOMS Shoes. Gains of over 1500% were possible. 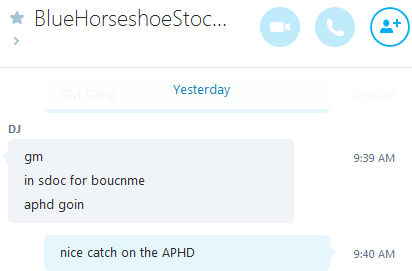 Feel free to join our traders chats by sending a Skype request to user ‘stocksumo’.